1. You must be traveling with your pet. 2. The pet must be a dog or a cat. 3. The total weight of the pet carrier and the pet may not exceed 20 pounds. 4. The pet carrier must fit under the seat in front of you and it, or your pet, may not be removed for the entire trip. 5. Excluded from the 'All Your Pet Can Jet' pass are flights to Jamaica, St. Lucia, and Barbados. 6. Pet owners can not share pet passes with other humans; however, the owner-holder of the pass does not have to take the same pet on each eligible flight. 7. Pass holders are not guaranteed a flight just by holding a pet pass. There are only four pets allowed on each flight, so the owner should make reservations for himself and the pet as soon as possible after purchasing the pet pass. 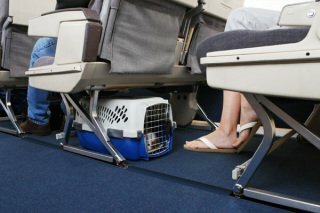 Fares for pets on JetBlue are normally $100 each way, but the pass allows unlimited reserved flights for dogs or cats, as long as they travel with the same person on all flights. Good deal? If you think so, better get your 'All Your Pet Can Jet' pass right away. JetBlue did not state how many passes are available. See all the rules at JetPaws, Have Paws, Will Travel. Cat Versus Cat Balloon! Who Will Reign Supreme? The Animal Video of the Day!! !